Welcome the fall class of North Texas Master Naturalists to our chapter! Speakers are confirmed. Special guests are invited. Trunks are requested. Projects are plotted. Field trips are planned. The schedule is set. Applications are reviewed. Acceptance (and wait-list) emails are sent. The Board approved a cap of 50 students in this fall class, and now contemplates the administrative burden of managing 100 new members a year. We need you! Volunteer now to support Susan Walters with managing membership and assisting with our VMS system; join Whitney Wolf’s communications team; step up to serve as Vice President; raise your hand for outreach; or help me continue to curate this fall class. Juliette Angulo plans to develop and host a series of events in Spanish. This commitment along with the groundwork laid by current members Francis Gonzales, Yolanda Arteaga Gonzalez and Victor Cruz-Adames means our chapter could begin hosting bilingual naturalist education opportunities in the very near future. Juliette first learned about our program at a Conservation in Action workday at Cedar Ridge Preserve, then saw our booth at Oak Cliff Earth Day, and attended an edible plant walk and moonlight prairie walk. Anil Bhaskaran recently graduated from UNT with a degree in environmental science with major casework in Biology. Anil’s favorite insect is the stonefly, an indicator species for healthy streams; and he is interested in stream and river ecology. David Borrego researched bears at Philmont Scout Ranch and educated campers on black bear ecology and safety. My neighbor Tom Willard recruited David on the trails of Cedar Ridge Preserve. Caleb Brackens supported this fall class effort from the very first committee meeting this past January. You may have already met him at one of our membership meetings. He thinks we’re “a bunch of goofy, outdoorsy people” and he wants to be goofy with us guys outdoors. He shares my interest in guerilla gardening programs, and is already a Dallas County Master Gardener. Charles Cathcart & Kate Whidden have already contributed countless hours to this fall class effort in scheduling field trips. Charles grew up in Canada and LOVES the outdoors. Kate serves as Director of Leadership and Governance at the Momentous Institute and intends to apply this education in her role as head of nature-based programming. Laura Coyle teaches life sciences to 4-6th graders at a local Montessori school and intends to connect student learning to opportunities in the community. She already participates in creating school gardens and outdoor learning classrooms. Megan Davis currently serves as the Development and Outreach Coordinator at Groundwork Dallas and assists with their Green Team youth program for high school students focused on the environment and conservation. Faye Dunaway intends to apply her naturalist education to the social emotional health work she accomplishes at the Momentous Institute, and incorporate into the curriculum she teaches. Rachel Elmalawany is an elementary science teacher and certified instructor with Real School Gardens. Rachel teaches educators how to integrate the school garden and gardening into lessons, including math, science, reading and even social studies. In college Rachel minored in journalism and wrote a feature piece on Gardeners in Community Development, a small non-profit community garden that serves local refugees. Amanda Flint was accepted by the spring class committee, but chose to wait for our southern Dallas county class. She has also assisted with the fall class committee and intends to be involved in our herbarium, habitat restoration, wildlife and plant rescue, and leading outdoor walks and talks. Ryan Giesecke serves as the Trinity Valley Beekeepers Association president. He has long wanted to join our chapter, but the training classes always conflicted with his beekeeper meetings. Ryan is an arachnid enthusiast, experienced educator and speaker. His favorite pollinator is our native bumble bee. Erin Hatchett is a professional wildlife biologist and environmental consultant for an engineering firm, another Tom Willard recruit. Regina Hebert just retired from the City of Dallas Police Department where she served as a Detective. She found Master Gardeners at the State Fair one year and then researched more and found our organization. Cathy Hodge was recruited by our Education Outreach Director and teaches at Children’s University alongside Tabatha Knickerbocker. David & Cindy Holliday are a power couple in our community and seriously good problem solvers. Sarah Hutchings is currently a biology professor at Mountain View College, recruited by Adam Cochran and Lori Delacruz Lewis, who is the Sustainability Coordinator and my collaborator for this fall class. Sarah publishes and edits STEM-ing Hot News and facilitates STEM Honors Learning Community. 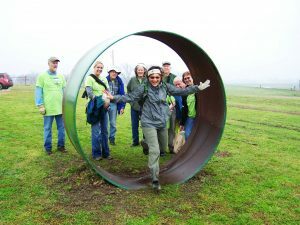 Elissa Izmailyan currently serves as the Director of Cities Connecting Children to Nature and brings prior experience as an environmental educator and environmental policy expert. In a prior life, she worked as a seasonal interpreter with Massachusetts Audubon and New Mexico State Parks; and worked in urban environmental policy for 10 years, including roles with the Trust for Public Land and currently with the Children & Nature Network. Rose Kreditor serves as Associate Area Director for AIPAC and has experience as a science entertainer for Mad Science of Greater Boston. Thor Larson is currently a PhD student in biology at the University of Texas at Arlington and his favorite tree is the Burr Oak. Alex Marquard is a field supervisor and trail builder for Groundwork Dallas. Amy “Moonlady” Martin currently serves as the social media manager for Native Prairie Association of Texas, is a published author, lifelong journalist, and current North Texas Wild columnist for GreenSourceDFW. Katelyn Miller earned her B.S. in wildlife conservation and her M.S. in biology with a focus on ecology. She is currently a lab assistant in the Dallas County Community College District. Joseph Mruzek is another PhD candidate at UTA in quantitative biology. His favorite insect species is the “Megaloptera” aka hellgrammites or Dobson flies. He sampled for insects in mountain streams and the largest he’s seen was 4.5 inches long! He learned about our program at the Region 6 EPA meeting. Kim Owens is a Professor of Art at the University of Dallas. She wants to share this naturalist knowledge in her classroom and beyond in order to advocate for the preservation of natural and native landscapes as part of urban environments. Katrina Pound earned her doctorate in ecology and is a Postdoctoral Research Assistant in biology at UTA. She already volunteers with the Texas Stream Team. Amanda Pounds likes “Horseherb (Calyptocarpus vialis) because it is a lush and beautiful ground cover that requires next to no attention or maintenance, provides a readily available food source for pollinators, has the cutest yellow flowers, is native, has a fantastic name, and it comes close to out-competing the evil Bermuda grass!” She intends to learn more about our Blackland Prairie and ensure future generations are able to enjoy the natural beauty of North Texas. 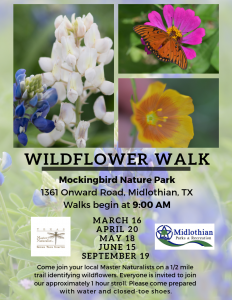 Anne Sansone volunteers for the Blackland Prairie chapter of NPAT and intends to raise awareness for our historic, rare prairie ecosystems and inspire urban citizens to utilize native plants in their landscape. She is a retired teacher and enjoys research. Thank you Tom Willard, Anne Weiss, Richard Grayson and Carrie Robinson for recruiting her! Hannah Schumacher just graduated Texas A&M with a degree in Recreation, Park, and Tourism Science, and earned a certification in Youth Development and Community Recreation and Park Administration. She will be teaching outdoor education at Blackland Prairie Conservatory & Atelier this fall. Ashlyn Stevens earned her B.S. in biology from Texas State University and serves as an Interpretive Guide at Dallas Zoo. Kristen Stock serves as an Elementary Assistant Principal and Outdoor Learning Center Coordinator for Newman International Academy (on the Northwood Campus) in Cedar Hill. Kathryn Trainor for more than four years has “worked for Partnerships in Parks, a public-private program focused on developing occasional park volunteers into community leaders, building long-term investment in public space and strengthening the social fabric of those neighborhoods.” She currently serves as the Volunteer Program Coordinator for Trinity Park Conservancy. Melissa Walker currently works as an environmental education specialist for a local municipality, developing curriculum for water quality, stormwater pollution prevention and flood safety for both adults and students. And this list isn’t complete! This class achieves our goal to increase and strengthen diversity in our chapter and volunteer base. 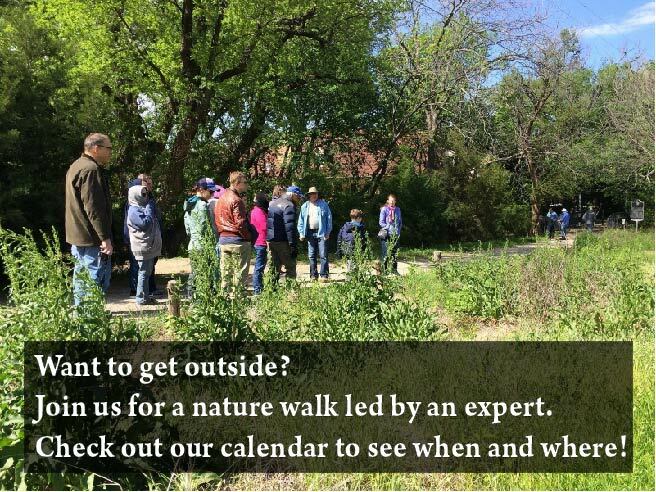 By extending our naturalist education and training into southern Dallas County we will achieve our goal to strengthen our commitment to our project partners and increase volunteer hours at Dogwood Canyon Audubon Center, Trinity River Audubon Center, Cedar Ridge Preserve, John Bunker Sands Wetland Center, Twelve Hills Nature Center and more. I feel fortunate to surround myself with brilliant people dedicated to my community.